How to Build a Plant Propagation Box for Rooting Cuttings. The plant propagation box that I am going to show you how to build in this video is really, really easy to build. You can make it any size you want from a little tiny one and as large as you want. You can use this box for rooting cuttings all year long. Flats of hardwood cuttings out in the cold. For the most part we don’t stick any cuttings in the spring because the plants are busy trying to make leaves and put on new growth, so spring is really about the worst time of the year to make cuttings. But here in zone 5 softwood cutting season starts after the first week of June. So if you are in a warmer or colder climate than we are here in Northern Ohio just identify what week of the year most of the plants in your landscape start putting out new leaves and count forward about six weeks. That’s when you can start making softwood cuttings and you can continue making cuttings all through the summer, the fall and into the winter stopping about March 1st. Here’s something that I want you to think about. I really work hard trying to bring you the best, most original gardening content that I can. 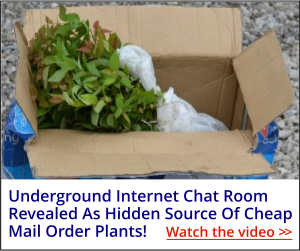 I show you how to grow plants that you can sell for money. So . . . if you are growing and selling plants for profit I am going to ask you to buy My Backyard Growing System for two reasons. 1. It will help you. It will help you more than you can imagine. It’s very inexpensive and you only have to grow and sell a few plants to recoup your investment in my system. 2. I don’t get paid for writing articles and making videos. I spend thousands of hours doing that, and I don’t get paid for all of the free content that I provide. I don’t sell advertising on my websites. I turn down potential advertisers all the time. I don’t want my sites cluttered up with ads. So the only way that I get paid for doing what I do is by selling my system, Small Plants, Big Profits from Home. I am new at building boxes. I have the wood and know the box in the video is 5 ft and 42 inch sides. You don’t tell what sizes to cut the pieces for the top. It probably is common sense answer but could you help me out with those lengths please. Thanks. For hardwood cuttings you don’t need a cover, I’m having far better results with them uncovered. I just had a call from a gentleman who would like to know if used tires would make good propagation containers? He would throw the tire on the ground, fill it with sand and put his sticks in them. What do you think? Would the rubber harm the sticks? Hey Mike – great video; thanks! It’s June of 2013 now… Have you seen the results of the experiment, yet? I have, now keep in mind, these are hardwood cuttings, but I found the potting soil worked better than the sand in this situation. I’ll still use a lot of coarse sand in my propagation efforts, but not for these hardwood cuttings. And in the propagation box in general I think I’ll use potting soil even in the summer. Mike , this might be a strange question, but do you think I could use one of those large water jugs from the drinking fountain as a propagation starter? or would the slight blue tin in the water jug effect the photosynthesis or the plant in a negative way? The water jug would work fine but it would need holes drilled in the bottom and it would have to been a really shady spot, and or painted white so it doesn’t get too hot inside. Have you ever heard of useing an aqarium pump and air stone to decrease the time it takes to root cuttings? I just purchased your program Mike 🙂 I never thought of selling plants before. Truth is, last year I planted Elderberry,Nanking Cherry and Hazelnuts and learning how to make more just for me is well worth the price of the program even if I never sell one.Don’t get me wrong, I’m going to try hard to get this going. I’m just saying that if for whatever reason it doesn’t work out I still come out way ahead dollar for dollar. Mike; I just don’t get a complete picture of the Box. Like what is on the bottom of the top box or is it filled all the way up from the bottom box w/sand etc. or how is it set up. I’ve tried doing cuttings last year with differant trees and plants and only got a return on Elderberry plants everything else dried up. I’ve started again this year with Elderberry cuttings so, hopefully we’ll see. I noticed you said no to starting cuttings in a greenhouse. Does this mean even “heated” greenhouses? I have a 9′ x 12’heated one and was wondering if there is anything I can “cut and dip” and put it there this time of year? Happy Holidays and thanks for all you do for us all! It makes me really excited because I love growing from seed or cutting and seeing God’s handiwork in action! It is A very cold and frosty December here in the North East United Kingdom. This project is top of my list when the weather gets better. Thanks for this. Can I use plastic instead of the wood used in here to make the box. Anwesha, sure you can use plastic. Lots of people use plastic totes with lots of holes drilled in the bottom. But the totes do break down from the sun and only last a couple of years. But they’re cheap. Lots of holes in the bottom! Thanks for the info, this video is awesome! I am in Louisiana. Is there any certain time that is better for trying to root camellias, roses, or dogwoods. I got a lot of Gardenias and a few azaleas to root earlier in the fall but the camellias and dogwoods didn’t take. Hey, Bibs. Received your system a couple of weeks ago. Thanks for the speedy delivery. Tomorrow is prop box building day. By the way, I am in SE Missouri. Are there any Backyarders close to me or do you have any way of knowing that? Thank you for what you do. Appreciate You. Mike, you are looking great with the weight you are losing, now just go to Good Will and get some clothes that fit you better. Then take that set of jeans and shirt and nail it to the wall of your barn so we can see how well you are doing. You will look and feel better too. Thanks Donna, I do have some new bibs, but . . . well you know, they’re new and I’m a guy. They also need to be shortened and I just haven’t gotten that taken care of yet. Mike…I live in Florida and have nothing but sand in my front and back yards. NOTHING. How the heck can I grow plants? Tom, Amazingly enough plants do okay in sand. You can make a big difference by just working in some rotted bagged cow manure when you plant and fertilize with organic fertilizers. Keep in mind, in the nursery business we grow plants in containers in soil less mixes. No soil at all. Mostly bark. We fertilize to give the plants the nutrition that they need. They thrive when grown like this. Michael, you’re welcome! Stay tuned. As the seasons go on I’ll offer up timely information keeping your informed about what I’m doing in my nursery so you can stay on track. wrap the wood with old plastic bags and use an iron and aluminum foil to heat seal it all together. Mike, thank you so much for your time. I received your system & love how you keep it simple! I built a cold frame, do you think it will get too warm in there for hardwood cuttings I take in Dec? Pam, it should be fine. Covered with white plastic even in the summer you can do cuttings in there. Thanks for becoming a member! As someone who has never built anything before, do you use nails or screws to make the frame? I would think nails would be easier, but would it split the wood being that close to the end? Is there a trick for holding the 2 pieces of wood in place while attaching them to each other. Thanks for all your info. Deborah, nails or screws. If you use screws you can pre drill a smaller hole and drive the screws in with a power screw driver. Nails work fine though. I’ve done both. Ring shank nails work very well. If you are going to move the frame, stiffen the corners with another piece of wood; for a 4 X 8 box I recommend a 7 inch long 4 X 4. Is it too late to do blue Spirea cuttings yet this year? I had one die and I wanted to start a replacement from one of the others. Dan, you can try, but mid June would probably be ideal. The wood is softer then and they’ll root quickly. Mike, I have a start-up gardening business with a dismal income. I constantly study and research issues about plants and trees. I’ve been on your email list for 2 years. I hugely appreciate the information you give us. When I can afford it, I will most definitely buy some of your great products. Mike, I’ve been sticking various evergreen shrubs with mixed success for years, just cutting a twig here and there and sticking them in existing flower pots. Since I’ve been out of work, stupid neurological condition, I’ve been looking for ways to survive and am considering seriously starting cuttings. If I can figure out how to sell them, I’m buying your book for myself and my best friend. Thanks for the starting help! Mike I enjoy all your videos and newsletters!! I also am writing to congratulate you on your weight loss!! I have lost 50 lbs recently too!! And just for FYI – I wear overalls 99% of the time!! Keep up the good work- Wayne in West Tennessee!! Wayne, that makes us weight loss, bib wearin brothers! I hope you don’t mind, I tell everybody your my mentor,when they ask where I gained all my knowledge the weight loss program looks to be going well, congratulations! Take some time off and take Pam to Donegal when the fuchsia is in bloom. You will never be the same man again. Bought your system and love the advise. Any reason not to start cuttings indoors over the winter?? I figured If I rooted them over the winter I could put them out in the spring. You can save a step by using white plastic instead of painting the clear stuff. Grower’s Supply has it. Some local places do, too. Mike.. sorry I should have also commented on your weight loss ! Looking Great there ‘Young Fella’ ! I just hit the 50 Mark on 11/11..but Ma-in-Law says ’50 is the New 30′..so I will take that ! Oh, and see..they are ‘Truss Plates’ ! Hi Mike, nice rooting boxes, I’m trying it in my backyard in California on a small scale with plastic boxes. My question is how do you keep out the slugs, snails and bugs? My rooted cuttings and seedlings keep getting eaten! I’ve also had some problems with mold, but using the coarse sand or perlite seems to help control that. You look great from your weight loss. Congratulations, it’s not an easy thing to do. Maria, thank you, and you’re right. It’s not easy. Once you get started and are committed it goes pretty easy, but as you probably know, so many false starts. Now to keep it off. Thanks Mike you have helped me so much. I have planting since I can remember,I have sold in in the past. I’m ordering your book an take my favorite hobby serius,with your help I will succeed . By the way my daughter is getting into this hobby , now we are two. Mike: I’m interested in boxwood cuttings. Would you have any advice on propagation of said boxwood cutting and their handling? Michael, Boxwoods are pretty easy to root, but grow slow at first. 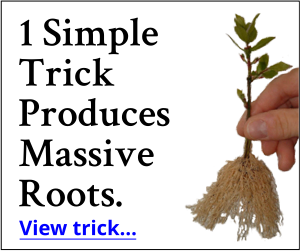 You can do them now, but they’ll be very slow to root. Might as well and stick them in frame just like this in June or July. Make sure the top is painted white and in a shady location for summer use. I live in Fl & we propagate all year round. Just stick it in the ground it grows! I will be building mine today and Mike, great videos Iam slowly getting ready to retire and getting everything in order before I retire.I have already build 2 hoop houses 28 x 10. How sensible to plan your retirement ahead of the time and get everything in order before you do. – only six rooms and corridors and garden redesign to finish – one more year should do it. Excellent video. I’m planning on making a smaller version for some vine cuttings I’m getting from my nephew. The metal connector you held up looks like a Simpson Mending Plate. Ron, A Simpson Mending Plate? Someone else said truss plate, but I think both apply. Thank you! Thank you for the great videos you provide. I do not do plant for sell but looking into your program. Great video! You are looking much younger too. Also saw the video you did in the cemetary on your Dad. Donegal seed potatoes are still the best to be got. Have you ever been there? If not, you should go. You’d love it. Eamon, I have not been to Ireland. My son and his now wife did go, but so far Pam and I have not. They didn’t see Done gal, they were around Dublin. It may be illegal to bring plants or seed potatoes such as the Donegal into the United States. This is because the dirt can harbor nasty bugs. Mike, I just gathered some acrons that I would like to see if I can get them to grow. What is the best potting for planting these seeds/acrons? I have the Burr Oak and Spainish Oak acrons. Great video Mike, I don’t do plants for profit and our backyard is small but I’ve learned a lot from you. I’m especially interested in cuttings and this video helps! Thanks! Excellent Idea ! Easy and Cheap ! I am just planning on doing a similar Propagation Box..(not quite that large!) and am just going to use course sand..but your results come spring will be interesting with the two mediums ! Those are ‘Truss Plates’..used in the assembly of Roof Trusses..’nasty lil critters’ as they are sharp, but are very handy ! Keep the videos coming Mike ! Jerry, thanks. Truss plates huh? Suppose I’ll remember that? I should, but we’ll see. Thanks again, for another great video. I can’t wait to get settled in our new place, so I can get a copy of your growing system, and see if I can grow plants for money too. I LOVE growing plants, and I had never thought to do it for money, so trying your system is exciting to me. Have a great Christmas!! Danelle, you’re welcome! I hope to see you started as soon as possible, it’s fun!